Open crescent roll tube and unroll the dough. Separate dough into 4 section (each with 2 triangles). Place each section on your work area and push and pinch together holes, so that you have a solid rectangle of dough made from 2 triangles. Break 1 slice of cheese in half and place both halves in the middle of the dough rectangle, in a line. Top cheese with ¼th of the eggs. Top eggs with ham slices, folded as necessary so that they will fit. Fold short edges (the ends) over the filling a bit. Fold one of the long edges over the filling and continue to roll up filling inside of the dough. Pinch edges to seal. Bake for 12-15 minutes or until golden brown. Serve immediately or if using for breakfast on-the-go, allow to cool completely and then wrap individually in plastic wrap and refrigerate. Freezing tips: If you want to freeze for later use, place individually wrapped roll ups into a freezer bag, label, seal, and freeze. To reheat: Remove from plastic wrap and reheat in the oven on 350 degrees F until hot and heated through (recommended method). If you prefer, you can also unwrap from plastic wrap, wrap in a paper towel, and reheat in the microwave. 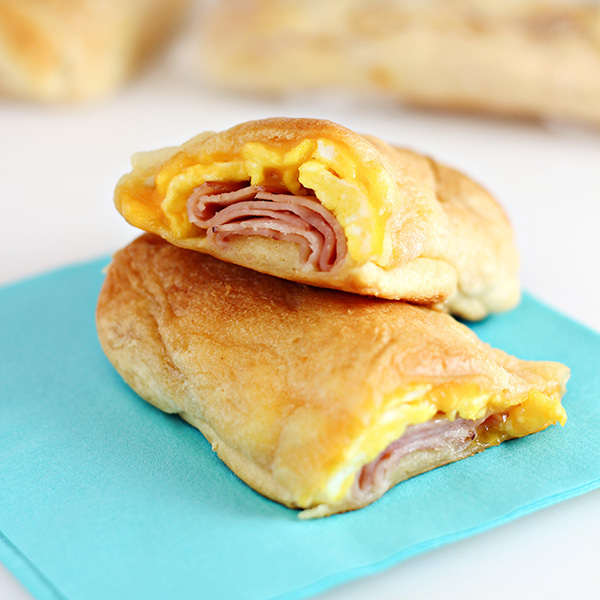 Want to make smaller Cheesy Ham & Cheese Roll Ups? You can also make these with just 1 crescent roll triangle of dough to make them half the size. Adjust other ingredients as necessary. Making breakfast the night before our road trip isn’t the only thing we do to save time. 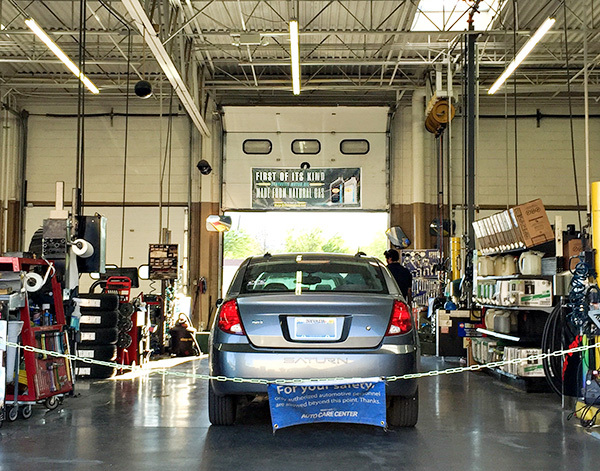 We always do an oil change before we leave and we like to have our oil changed at the Walmart Automotive Care Center. This way, we are able to get last minute shopping done for our trip, while our car is being serviced. That’s how we get stuff DONE! To take advantage of the time-saving convenience of getting your oil changed at a Walmart Automotive Care Center while you grocery shop for this road trip breakfast idea, there is a few things you’ll want to know. First, pull up near one of the bays at the Walmart Automotive Care Center that say “lube” and wait for an associate to come out to you. They will ask you what type of service you want. Tell them you want an oil change and I recommend asking for Pennzoil products. 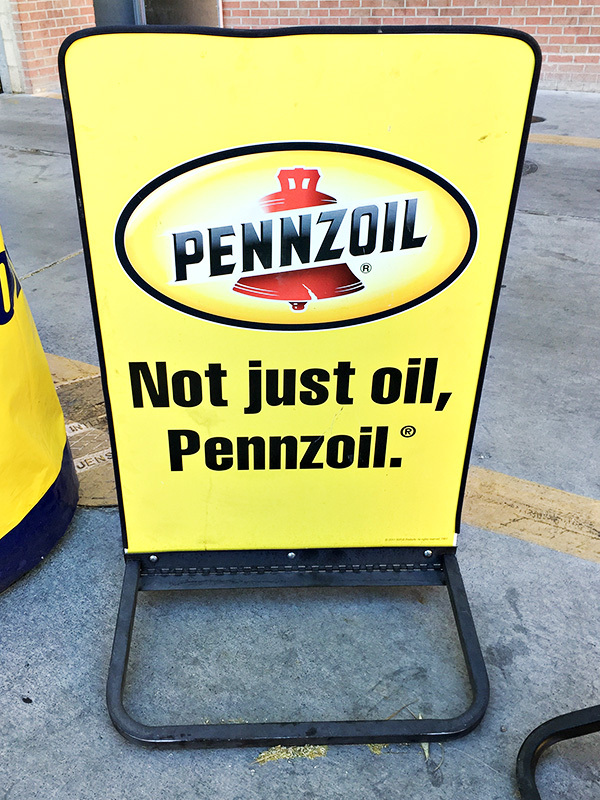 Pennzoil is well known to help clean out the sludge that other oils can leave behind. Pennzoil also gives your engine a more complete protection and a free warranty that covers 15 engine parts that may fail due engine wear. Second, you will have to tell the associate which Pennzoil option you want. I like to go with the best option available, which is the Pennzoil Platinum Full Synthetic. It’s top of the line for cleanliness and protection. It is made with “PurePlus™ Technology” (a process that converts natural gas into a 99.5% pure base oil) which has been proven to keep pistons up to 40% cleaner than industry standards. I hope my easy road trip breakfast recipe and oil change advice helps you save time and money this summer. If road trips are in your future, I encourage you to stay connected to Pennzoil for their latest information and updates. You can find Pennzoil on Facebook and on Twitter. We’d love to hear from you: where will the road be taking you and your family this summer? How great are these!! Love them!! Thanks for sharing with us at Throwback Thursday! This looks great, my oldest would eat these right up! Thank you for linking up to last week’s Tasty Tuesday. I’ve pinned your recipe to the Tasty Tuesday Pinterest board. I hope you’ll join us again this week. I love this simple and easy on the go breakfast. Thanks for sharing with us at Family Joy Blog Link Up this week. So easy – and road trip perfect! Thanks for sharing on the What’s for Dinner Linky! Hi! These look great! Are they good cold? We’ll be on the road at breakfast without access to a microwave, and was wondering if I could just pull these out of the cooler. Has anyone tried assembling them the night before and baking them in the morning? Hi Tracey! We haven’t tried that yet. It’s a great idea though — we’ll test it out the next time we make them. These look tasty! Have fun at Comic Con. I’d love to go but I’m very far away and I think the crowds would be too much for me! These look super tasty! Plus I love having breakfast ready to go when I get up… mornings are so not my thing (on the road or at home). I so want to make these! And I’m not even hitting the road to Comic Con! Have fun!